What are the best walking shoes for women? That's actually not an easy question, as everybody's feet are different. When you are looking for new footwear (especially for sports shoes), the most important thing is to keep your personal foot shape in mind. In my buyer's guide you will learn what arch type you have and what your pronation level is. After you know more about your foot type, you will be able to make an informed decision about buying the optimal pair of sneakers for YOUR feet. Last Reviewed on 3 February 2019 - Checked products and minor content revisions. Athletic walking shoes were meant to be used on a regular basis. The best shoe models are the ones that feel comfortable on YOUR feet when you're walking five or ten miles over rough terrain during the occasional miserably rainy day. In case you're male and somehow ended up on this page: Read my guide about the best walking shoes for men. In the following table you will find some of the best rated walking footwear for women of all ages. You can click on the column headings to sort the rows. Type - What's the type of the shoe? You will recieve a detailed explanation of the different foot and shoe types below. Weight - The weight of one shoe. Lighter = better. Naturally, models with more support are heavier. Rating - How online users have rated the product. By clicking the green button you will be lead to a product review from us. Price - How much does it cost? Buy - Links to an online store, where you can buy the product. How to choose shoes for YOUR feet? If you ever felt like your feet are not like anybody else's, you're not just imagining things. Feet can be very individual and you'll need shoes to match. When shopping for walking shoes that provide the right kind of support and cushioning, the important words to remember is pronation and arch – or what your foot actually does when you walk. Overpronation happens when your foot rolls inward too much, creating instability when your foot and ankle have trouble supporting your weight and the foot's natural ability to absorb shock is compromised. Overpronation also puts a lot of extra pressure of the big toe and second toe because they bear the brunt of shoving off again with the front of the foot. Motion control shoes are best for people with collapsed arches (flat feet). Underpronation (also called supination) happens when the foot rolls inward at less than 15 percent, which puts more pressure on the outside of your foot and your little toes that take the brunt of the work when pushing off with that foot. Cushioning shoes (also called "neutral shoes") will provide the kind of flexibility and cushioning you need to correct any difficulties you have with the lack of natural shock absorption. During normal pronation, the heel hits the ground first, and then your foot rolls inward about 15 percent to make contact with the ground and support your weight. When you push off with that foot, the workload is distributed evenly across the front of the foot. Note: This is the most common foot type. Normal pronators choose stability shoes. 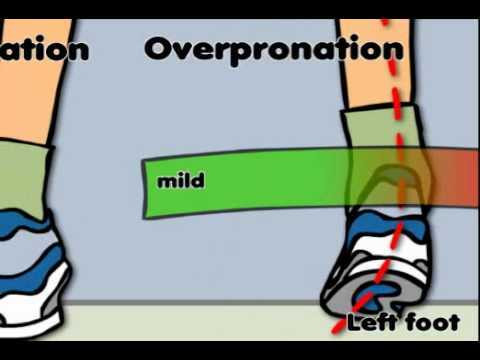 Measuring pronation can be a bit more difficult because, while pronation does tend to go along with arch, you usually aren't staring at your feet to see what they're doing when you walk. Take an old pair of shoes of yours (it doesn't matter if it's a sports or casual shoe) and have a look at the wear pattern on the outer and inner part of the sole. If the inner part at the toe and heel area is more worn than outside: You are most likely an overpronator and should wear motion control or stability shoes (depending on the level of inward rolling). If there's more abrasion on the outer parts: You might be an underpronator and should consider wearing cushioned walking shoes with a flexible sole. If the wear and tear is similar on both sides: Choose stability shoes. There are several factors that include walking habits you might have developed over the years, issues with the performance of your joints that could affect your gait, and any past injuries that your feet and legs might have suffered. Many retailers that specialize in walking and running gear usually have someone on staff who can analyze your gait and give you advice on the products you actually need to support your feet. These products may be as simple as a shoe insert that can help support your arch or may be a little more involved such as a specialized shoe like the ones that can help with plantar fasciitis. However, these products should not be considered a cure-all if you have any lingering issues with your legs and feet. In cases in which even the best walking shoes might actually fall short of what you need, you may wish to consult a podiatrist for any issues besides the arch that may be affecting your pronation. A good physical trainer may be able to show you exercises that help correct any bad habits you may have developed and optimize your joint motion. When combined with good walking shoes, these professionals can alleviate any existing issues you have with your feet and legs beyond arch and pronation. Arch is another important consideration when choosing the right walking shoe for your needs and actually goes hand in hand with pronation. Flat arches are usually accompanied by a tendency to overpronate, are fairly common in people weighing more than 165 pounds and would do well with a shoe that offers better stability and motion control. People with high arches have a greater tendency to underpronate and can develop problems with their knees if they do a lot of walking without the right support. Shoes that maximize flexibility and are neutrally cushioned are most likely to give people with a high arch the right kind of support. People with a normal arch tend to also have normal pronation and can benefit from a stability shoe with a moderate amount of flexibility. How to measure foot arch? A good way to “measure” your arch is to take a foot print on any flat sheet of paper using methods similar to fingerprinting. Dip your feet in water and then press them on a sheet of paper. Feet with a flat arch generally give the outline of your entire foot. Supination or “high arch” will give an impression of mostly the front of the foot and the heel. With a normal arch, you can see most of the foot in the imprint except for a large part of the outside of your foot. Motion control, cushioning and stability shoes are not necessarily the same package. In this section you will learn more about the differences between each shoe type. Motion control shoes are generally recommended for people with flat arches and overpronation. These shoes generally have a thicker midsole made of hard material designed to correct your gait and are a little heavier than most athletic shoes. Use of these shoes could be used in conjunction with exercises to correct severe overpronation issues and strengthen the ankle to reduce the risk of the ankle rolling too far and resulting in injury. Neutral walking shoes are the ones that focus on cushioning instead of motion control and stability. This type of shoe tends to be a little heavier than the stripped-down minimalist styles because they add thicker midsoles and more durability. This makes neutral shoes the most common type for people who have high arches or make use of orthotics. Stability shoes provide corrective support that is usually below the level of motion control shoes. These shoes can cover support needs for people with normal to high arches with a firmer material in the inner part of the shoe called a medial posting. Some shoes may also have additional features that promote stability but, if it doesn't have the medial posting, it's probably not a stability shoe. There are also walking shoes that can help with painful foot conditions such as plantar fasciitis, a condition in which the ligament that connects your heel to your toes swells up and makes walking, hiking or jogging painful. This condition is most common in the middle-aged and people who do a lot of standing, walking or running, such as athletes. Most doctors will recommend getting the weight off your heels and bottom of your feet as much as possible if you develop plantar fasciitis. Walking shoes that offer excellent arch support, a firm outsole and a slightly elevated heel can help reduce the “wear and tear” on this ligament while it recovers from the inflammation. Can running shoes be used for walking? One common misconception about walking shoes is the idea that it doesn't really matter whether you choose walking or running shoes for fitness walking. However, running and walking should be considered moderately different in not only the amount of force that the shoe must absorb with each stride, but also the parts of the sole that are impacted the most when running or walking. Walking shoes are typically lighter than running shoes and most of the stability features for fitness walking focus more on the heel that takes most of the impact, especially during fast or “power” walking, and overall walking stride that rolls from heel to toe. These features include a more rounded heel and more flexible sole. In some cases such as severe overpronation, underpronation, or conditions of the feet and legs that require extra support, you may wish to consult with a podiatrist to determine whether lightweight walking shoes, running shoes that offer more support, or a specialized combination of orthotics and stability shoes are better for your needs. In moderate cases, though, walking shoes that offer a good amount of stability and support for fitness walking are actually preferable for fitness walking to make sure your heels are getting a good amount of support. Finding the proper walking shoes can actually cut down on the risk of an inflamed tendon or any other painful foot condition that can be caused by improper support when combined with spending a lot of time on your feet. People who have tried motion control or stability shoes have indicated that it can be tricky to find a pair that works for them, so it's worth trying several brands to find the pair that best fits your support needs and possibly even looking online for a better selection. New Balance has made the fact that its shoes are made in the USA a major selling point and many of its women's walking shoes features a lightweight EVA foam to save on the weight of the sole without sacrificing cushioning. For an especially good orthotic shoe from New Balance, look for their Dunham line, which features the ability to replace the removable footbed with custom orthotics. ASICS' popular GEL and GT lines focus on advanced cushioning systems and guidance systems that encourage proper gate. Skechers is one of the leading athletic shoe manufacturers in the USA, besides athletic sneakers they also offer lifestyle apparel. But still, their main sales products are shoes. When you are doing a lot of walking activity in the summer months: Skechers is offering some of the best walking sandals for women in their product line. If your job requires you to be on your feet all day, you might especially look at the Caterpillar brand that is famous for producing durable shoes for people like you who work with those famous yellow heavy-duty machines. There are some specialized orthopedic brands (Example: Vionic) that can be a bit pricier but may be more helpful when it comes to finding a pair that suits your needs. When shopping for a pair of walking shoes for ladies, the return policy of the retailer is one important factor to allow for the return of any pairs that just aren't working for you after you get them home. Your orthopedic specialist may be able to recommend options and, in some cases, you may be better off shopping at some highly specialized stores or looking online to find what you need even if it means spending a bit more than you normally would for a pair of shoes. Keep in mind that some shoes may solve one problem but cause another if you do not address any underlying issues that may be affecting your gait, so pay attention to any warning signals your feet may be sending you that show up within a few weeks of buying a pair. Many experts also recommend shopping for shoes in the evening, when your feet are usually swollen after a full day on your feet. Personally, I like to buy my shoes on Amazon.com - most of the time they offer the cheapest prices and have a wide selection of models to choose from. I order multiple sizes so I can test which pair fits me best. The other pairs go back at no shipping costs - I never had a problem with their return policy. Do you often walk or work on hard surfaces? Check out my guide about the best shoes for walking on concrete all day. The most important thing to consider when shopping for the best walking shoes for women 2018 is that you should never settle for something that almost works even if it means spending a few extra bucks or putting in some extra effort to find exactly what you need. Even when an orthopedic shoe costs more than $100, that's less expensive and painful than dealing with issues with your legs and feet that occur because they weren't getting the support (cheap shoes) they need while participating in fitness efforts like walking. If anything at all makes you uncomfortable while shopping, including the occasional pushy salesman or a shoe department full of options that would have worked if they were just a little wider or came up a little more on the ankle, it's perfectly acceptable to just walk away and look elsewhere. Sellers of women's walking shoes should center around your unique needs rather than trying to fit you into a pair of shoes that just aren't working. They care about their bottom line and you care about keeping the bottoms of your feet healthy with a pair of shoes that can correct problems with overpronation or underpronation by giving you the extra boost you need to correct your gait. That may mean having a list of requirements from your orthopedic specialist in hand to show the salesman, but it's worth it to get exactly the shoes you need.